Generally kids love colorful food.My daughter Raksha is no exception.She basically loves drawing & playing with colors.So she always demands me to pack some colorful food for her lunch box.But she doesn’t like to take chapathi rolls or bread sandwich.She is an ardent fan of idli,dosa just like me .So i made this cheesy tri color uttappam for her lunch box.After coming from school,she happily said all her friends asked by seeing the colors “Is that national flag dosa?? “.She had proudly told No, its my mom’s dosa .This dosa recipe was a huge success with my daughter and i am making it very often for her lunch box with some variations(Refer notes).I usually add more carrots & less cheese as she likes to eat carrot in dosas and i don’t want her to consume more cheese.So this dosa tastes little sweetish.She likes to have this dosa with idli podi.Adjust the quantity of cheese n carrot and replace coriander with capsicum & even tomatoes based on your kids wish.U can also make this dosa for your kids after they come back from school as an evening snack.They will love to have it hot hot.So here you go,easy and colorful kids lunch box recipe – Cheesy veg mini uttapam.I am happy in sending this recipe to Indus ladies “ Kids lunch box recipes-100”.Special thanks to Chitvish mam for suggesting me to participate in this event .Friends,do send in your entries and get a chance for your recipe being published in a E-book.Both Bloggers and non-bloggers can participate.Please click the logo for more details. 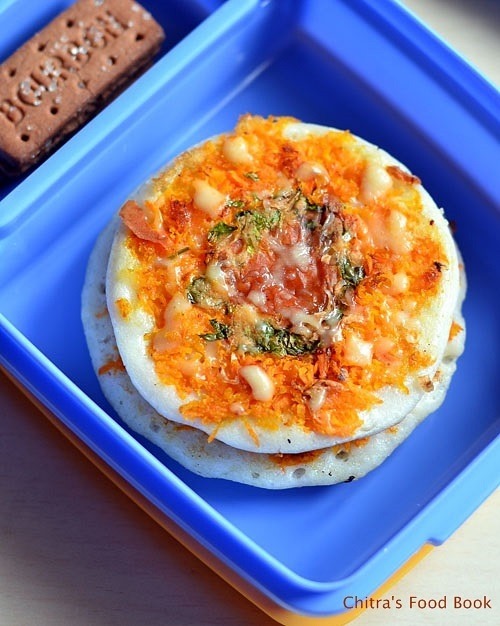 Easy n colorful cheesy veg uttapam recipe for kids lunch box. Wash and Grate carrot.Chop onions(if using) and coriander leaves finely.Grate cheese n set aside OR u can grate it directly over the dosa.Heat dosa pan and pour a ladleful of batter.Do not spread it.Batter should not be too thick or too thin.After pouring the dosa batter,simmer the flame completely.Leave it for few seconds.Bubble will start to appear. Now spread the grated carrot as outer layer and put some coriander leaves towards the middle.Lastly put the finely chopped onions in the center.Drizzle a tsp of oil/ghee around the dosa.Keep the flame low always else dosa will get burnt. Flip the dosa and leave it for few seconds.Again flip the dosa and add the grated cheese or grate cheese all over the dosa.Leave till cheese melts. Remove and serve hot or allow it to become warm and pack in lunch box. U can make the same dosa for adults by sprinkling idli podi or pepper powder over the dosa.Reduce the quantity of carrot and add more onions. Adjust the quantity of carrots as per your wish. Adding more carrot make the dosa sweetish. For variations,u can add finely chopped tomatoes & capsicum too. Sprinkle half a tsp of idli powder or pepper powder if ur kids like spicy dosas. Add double cheese for more cheesy dosas. Pack this colorful,cheesy dosa for your kids lunch box and make them happy ! Nice recipe dear.surely i ll try.but please check the3rd step some other recipe is added i think. Nice lunch box recipe ..Def any kid would love it not only raksha :) Lunch box is so cute . yummy looking colorful and tempting..